Calmar Pain Relief Therapy developed the country’s first center entirely devoted to the treatment of chronic pain using Scrambler Therapy. Visit us today! Calmar Pain Relief, LLC operates the only Medical Treatment Center in the US treating severe, chronic, neuropathic and oncologic pain patients exclusively using the MC-5A, an advanced new computerized medical device. Since November 2009, Dr. D’Amato and his medical staff have successfully treated over 1,250 neuropathic pain patients with a success rate of over 70%. Fifty-five (55) Health Insurance Companies, including thirty-seven (37) Workers' Compensation (WC) companies have approved and reimbursed Calmar patients for Scrambler Therapy (ST). The application of this technology, called Scrambler Therapy, transmits synthetic non-pain information through disposable surface electrodes on the skin (like an EKG) to surface nerve receptors. ST replaces the “pain” information with artificial “non-pain” corrective information (bioelectrical codes). Calmar is the Leading provider of ST in the U.S.
Dr. D'Amato and Staff have a proven track record of getting better results using ST, than any other ST provider in the U.S.
Dr. D'Amato and staff have more experience treating various underlying medical conditions causing severe chronic neuropathic pain that any other ST provider in the U.S.
Stephen J. D'Amato M.D. is Calmar's medical director and a leading national authority regarding Scrambler Therapy technology. 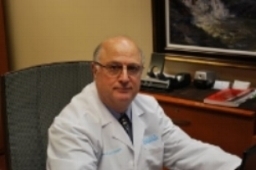 Dr. D'Amato has trained doctors and nurses from Mayo Clinic, Johns Hopkins, MD Anderson Cancer Center, Walter Reed Army Hospital, Harvard Medical Center and many others in the effective administration of ST. These doctors also refer patients to Calmar for ST treatment. Mayo Clinic and MD Anderson Cancer center recently started treating patients with ST in their clinical practice after conducting research for several years. This decision is compelling confirmation of the efficacy of ST from world renowned medical institutions. Dr. Charles Loprinzi, Regis Professor, Mayo Clinic, has successfully treated a chemotherapy induced peripheral neuropathy (CIPN) patient using ST. The patient has been pain free for over one year. Calmar has successfully treated over 350 patients with CRPS and over 900 with Sciatica and Lumbar Pain, CIPN, phantom limb pain, diabetes induced peripheral neuropathy and other medical conditions causing Severe Chronic Neuropathic pain . We are currently taking appointments in West Warwick, Rhode Island and Bonita Springs, Florida. Call us at 401-270-7077 for a current list of insurance coverage companies and a free preliminary evaluation.